"Extraordinary work, both conceptual and practical. The plan is quite remarkable and the level of collaboration is impressive." 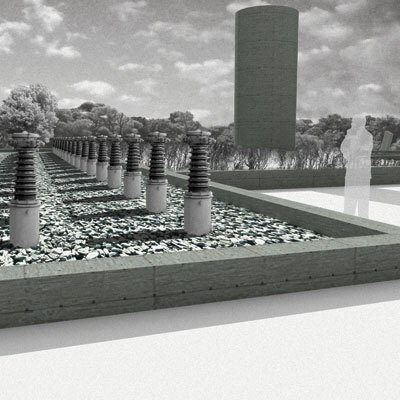 This undergraduate thesis project seeks to study the nature of natural and man-made resiliency as it relates to places and spaces formed by people. 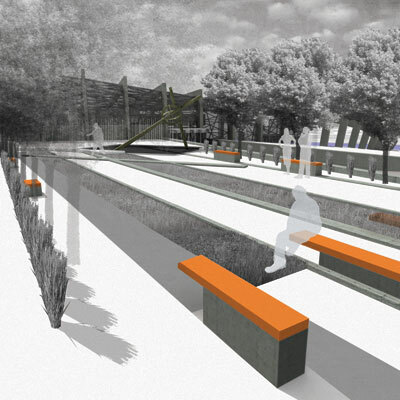 This is a joint landscape architecture and architecture project encompassing 75 acres of urban land in Moorhead, Minnesota along the Red River of the North. Specific site elements include riverfront interaction, an abandoned power plant, and a large urban park known as Woodlawn Park. The building typology is a center for the arts, and the landscape serves as a template in which vital interaction between the building, land and water becomes seamless. Used as a vehicle for studying resiliency in landscape architecture and architecture, the Moorhead Center for the Arts (MCA) is a community art center and adjoining park that features spaces for public and private interest open to the community. 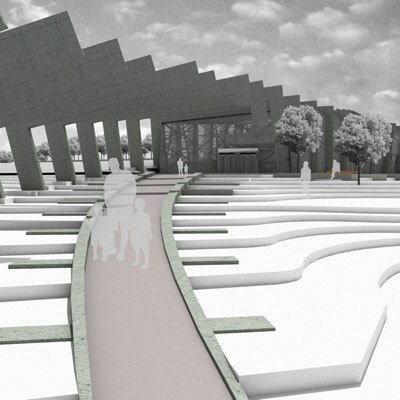 The Fargo/Moorhead area is always striving for new strategies to cope with the flooding of the Red River of the North; this project participated in that dialogue, acknowledging the river as a design opportunity. With the increase in both the frequency and level of flooding in recent years, the sustainability of this site relies on its ability to be resilient to natural phenomena. The current site is not resilient, and requires a great amount of energy and resources to restore it back to a suitable condition for park users. The park is left with a layer of mud and silt that renders the park useless. Further research was done to better understand how we not only perceive and experience space, but how we experience and perceive phenomena in nature. Although we are surrounded by it every day, we can become oblivious to places and spaces that have created our homes. Architecture is more easily understood through physical manifestation, but the idea of creating something with the land that not only interacts with the building, but with the user to create a strong sense of phenomena was our focus for this project. The ability of landscape architecture and architecture to respond, react, and participate in the natural phenomena, or nature of a site, is the ability of the design to be resilient and thus sustainable. Examining the nature of natural and man made resiliency formed by people, we found our first source of inspiration from the river itself through the small rock dam located on the site. It seemed to us that the dam was a point of origin, emitting waves of sound, and creating interesting glares which made it a significant place for people to enjoy along the river. Ra diating from that point are dramatic cuts in the earth, a shockwave of the effects we impose on the built environment. The dramatic cuts are made interesting when experienced in section, and the rising water begins to animate the design. It is from this point of emission which we began to organize our site, and develop the building creating both built and natural environments as a piece of clay; continually sculpting each to complement one another creating interstitial space meld together as one cohesive whole, feeding off each other. These ideas were made clear and further contrasted with underlying grid imposed on the site, but taken from the regional context. 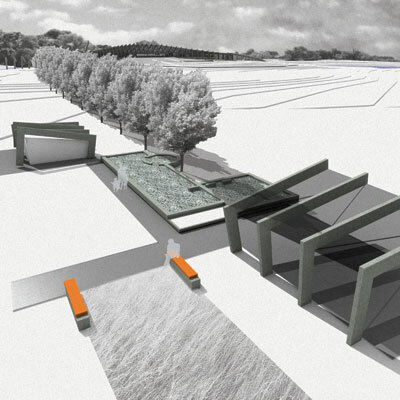 The strong axial relationship between the community and the river through the shelterbelts is to encourage users to move through the site and experience the many thresholds felt in section. The idea that the building could grow from the land came as we searched for the link between art and the natural and built environments. It is then that the building is a physical manifestation of the process of creating art: pulling materials from the Earth and harmoniously joining them together to create a work of art, with an eventual returning to the earth. Together, the building and landscape work together to create emotion both inside and out. The site design attempts to be kinetic and focuses on design through tectonics in the way we looked at the earth and building materials. The kinetic properties of the site were made clear through design and how the user can feel the natural forces around them at play. As a collaborative project, the lines between landscape architect and architect were blurred beyond distinction. Each of us felt willing to listen and learn as we looked at this as a one design problem, but an even bigger design opportunity to cross our disciplines. As a Landscape Architecture student, I was more interested in the layout and true connection with the community, MCA building, and the river. My partner was more experienced with the building details and the use of tectonic expression, being that he is a student of Architecture. In the end, we both hoped that the traditional molds of our professions would be broken down, and one design would prevail that hinted slightly at the two disciplines involved.